McDonald’s golden arches, Target’s bull’s eye and Starbucks’ mermaid are all instantly recognizable symbols for their brands and they have an impressive retail impact. But more than just a name and logo, your brand includes everything from printed materials to your customer’s experience. “All of these things work together to shape the perception of the brand and assist in your client’s ability to place value on the quality of products and services you provide,” says Daniel Hanners, graphic design instructor at The Illinois Institute of Art – Schaumburg and brand consultant with 18 years’ experience in the design industry. Along with Laura Sauter, graphic design instructor at The New England Institute of Art and principal at Agency Bel, which helps business owners build their brands, Hanners offers tips to help you brand your small business. “When creating your brand, identify and communicate early on in the process your core brand values and the promises you are making to your clients,” says Hanners. “These values and promises will guide the decisions you make for your brand.” Sauter recommends setting aside an adequate time frame and budget. “The biggest challenge for small businesses is that the owners of the businesses don’t give themselves enough time for the project,” she says. “With branding, you want all of your efforts to pull in the same direction,” says Sauter. “Verbal and visual need to say the same thing.” Branding is an important investment that should be made early, and a good brand solution should last between five and 10 years, she adds. * What is your unique selling position? What sets you apart from other competitors in your area? * Do a visual audit of your desired costumer. Identify your audience and make a visual persona of your typical client. * Consider all of the environments where your logo will be used. This will ensure consistency and assist in brand recognition and loyalty. * Does it grab and hold the attention of customers and potential customers in a variety of environments? * Does the logo reflect the values and character of the company? * Can the logo extend into future business ventures? You should post enough to stay connected, but not so much that your audience becomes annoyed. You should also post lifestyle updates relevant to your clients and don’t make every post about your products. Reflect on what your website is doing for you. “Outside of showing pictures of your products, you can use your website to communicate your brand values, history of your company, sustainable initiatives and other important information that will assist in making a connection with your audience,” says Hanners. “Being involved in your community can have a drastic effect on your business,” says Hanners. One way to do this is to attend chamber of commerce meetings where you can connect with other business professionals in your area. 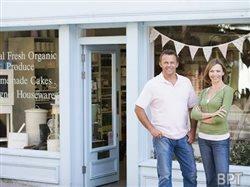 Giving back to local 501(c)3 organizations can help grow your business. Look for an organization where the mission reflects your brand’s values.